Posh centre-back Gaby Zakuani in action against Chesterfield. Photo: Joe Dent/theposh.com. Man-of-the-moment Gaby Zakuani is confident Peterborough United have enough strength in depth to seal a League One play-off place for the second season in succession. That theory will be tested next Saturday (March 28) as Zakuani and his regular central defensive partner Ricardo Santos will both miss the visit of struggling Coventry City to the ABAX Stadium. Santos will be suspended after he was sent off in yesterday’s (March 21) 1-0 home win over Chesterfield, while Zakuani will be on international duty for DR Congo who are playing a friendly international against Iraq in Dubai. Zakuani will be sorely missed. He’s been outstanding since Dave Robertson took over as Posh manager. Shaun Brisley and Christian Burgess will most likely form a new central defensive partnership against Coventry as Posh seek to protect their place in the play-offs. “In the past I’ve been asked to do things that I wasn’t comfortable doing,” Zakuani admitted. “I’m a defender first and foremost. My game is about winning tackles and headers and that’s all the new manager wants me to do. “Obviously that suits me and I’m very happy with the way things have gone for me and the team lately. I’m disappointed to be missing the next game as I’d rather stay here If I’m honest, but my country wants me to travel so I will and it is important to me as I’ve just become the first choice centre-back. “I’m sure the lads will cope without me, We have good strength in depth and Shaun Brisley and Christian Burgess have proved they can play well at this level. “We’re certainly showing great character at the moment. We bounced back well from a disappointing defeat at Preston and ground out another big win against Chesterfield. “We are enjoying the gritty battles and we are enjoying playing at home again. The manager wants to turn our place into a fortress and just lately we’ve done it. “We’re hard to break down, but we’re still creating chances to score. Chesterfield had a lot of the ball yesterday, but we created as manay scoring chances. “Five wins in six matches is not easy to achieve in League One, but there will be many teams who will be looking over their shoulders at us now. We have a big reputation in League One and we will be dangerous opponents for anyone. 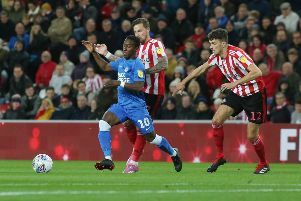 Most Posh fans yesterday believed Zakuani had tapped the ball against his own post during a second-half mix up with goalkeeper Ben Alnwick, but the centre-back revealed that it was a Chesterfield striker who nipped in between the Posh pair to make the final contact. Zakuani also revealed that Santos made the rash tackle that led to his second yellow card and subsequent dismissal because he didn’t see the Chesterfield player coming up behind him. “It was a mistake, but Ricardo is young and he will learn quickly,” Zakuani added.